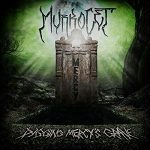 We are stoked to be giving away a copy of Murkocet’s new Digging Mercy’s Grave CD to one (1) lucky winner. For fans of Hatebreed and Lamb of God. To get your paws on a copy of Digging’s Mercy’s Grave, enter before Friday, March 24. Enter “Mercy” in the answer field below.